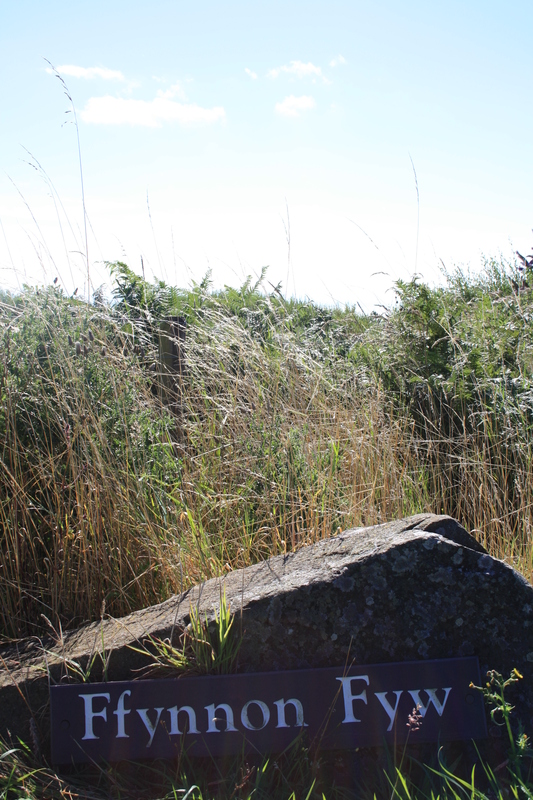 My previous visit to Ffynnon Fyw towards the end of 2013 was disappointing, in that the well, which had been restored so thoroughly some 10 years ago, had become so overgrown that it was virtually impossible to see anything. 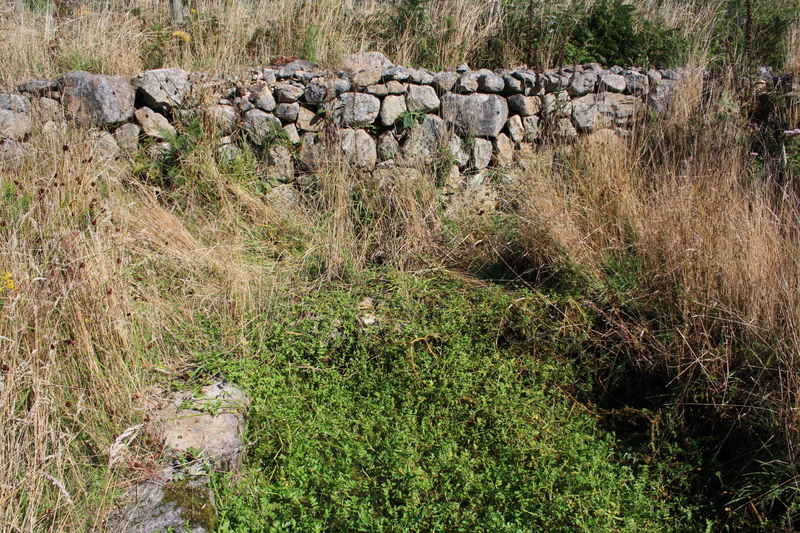 In June 2014 local volunteers, in association with the local council undertook work to clear out the well once again. It is now possible once again to visit this fascinating well. The pictures here show the well as it was in September 2014, my original moaning post with photos of how it used to look is retained below. Unfortunately experience shows that nature is never held back for too long, I hope now the well has been cleared again people will find the time, the dedication and the enthusiasm to keep it so and preserve this well for future visitors. . In a word Ffynnon Fyw was disappointing. If I were ever to start awarding star ratings it might perhaps achieve one single star, although that one would only be because it provides its own picnic table and a sea view. Mynytho is a couple of miles to the south west of Abersoch. Prior to my visit I had read much about a recent reconstruction project at Ffynnon Fyw, how it had been cleaned out, repaired and restored to take its place in the tourist booklets and on the visitor trail. 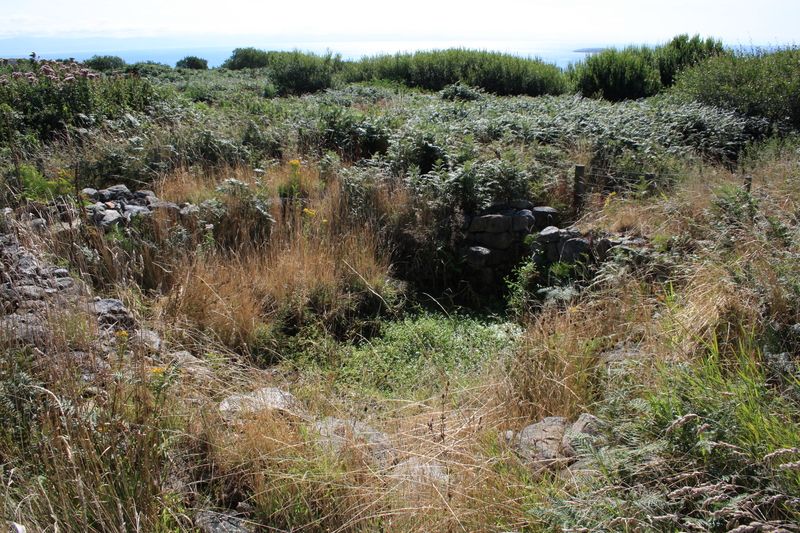 Sadly, by the time we arrived in August this year it had been reclaimed by nature and was overgrown to the extent that it was difficult to make out any of the features of the well. Sadly, this blog is rapidly becoming a photographic record of the various grasses and ferns that grow profusely on the Llŷn Peninsula, so I shall spare readers a detailed set of pictures this time, restricting myself to just two or three to prove my point. Perhaps however I am wrong to be surprised. Ffynnon Fyw appears to have undergone a succession of failed attempts to reclaim it over the last hundred years its natural state appears to be ruined and overgrown. In the 1890s folklorist and bard Myrddin Fardd mentions that the well was in reasonable condition after the local landowner had paid for restoration work to be undertaken, although by that time it was mainly used to provide water for animals. Ffynnon Fyw was described in 1923 as being in an area about 8 yards square enclosed by walls 6 or 7 ft high, with an entrance near the N end of the W side and stone seats on the inside. 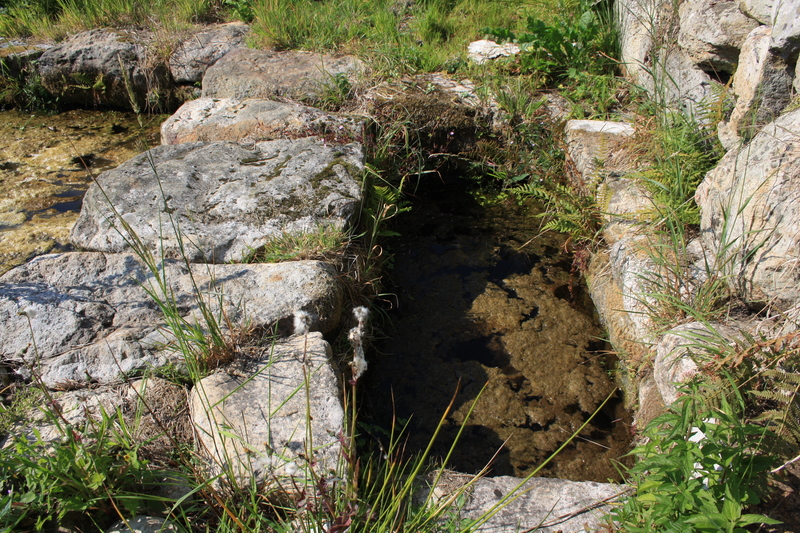 The main bath in the S part of the enclosure was about 4yds by 3 yds with steps to the water in the SE and SW corners. A smaller tank for drinking was adjacent on the N. Both were supplied from the spring outside on the S. The structure was restored about 1890 but has become too dilapidated and overgrown for detailed examination Condition: Bad. Still, by the 1980s their work had been lost and visitors once again struggle to find the well. 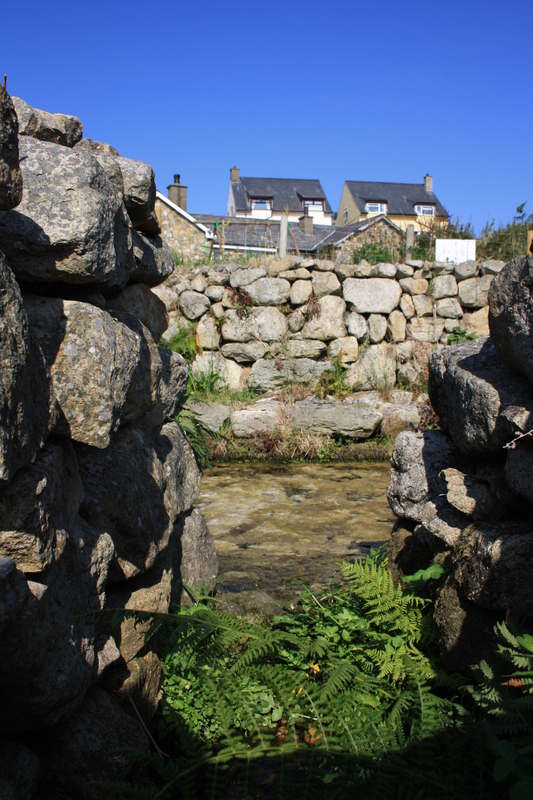 Eirlys and Ken Gruffydd record in their book the trouble they had finding the well in 1988 and after having been shown the site by a local man discovered that once again stone benches were dislodged and fallen into the water and parts of the wall were broken down. It was in the early 2000s that a new team set to work once again to repair and restore the well. Detailed pictures of this work can be seen at the Cymdeithas Fynhonnau Cymru website. During this period Gwynedd Council took this and other local wells under their wing, producing a set of consistent signposts and leaflets guiding visitors around the sites. It was this record that had given us hope that the remains of this potentially impressive well might be found in a good state of preservation, leading to the disappointment described above. However, should one be surprised? This exploration of the North Wales wells shows a very consistent pattern. Ffynnon Aelrhiw, recently restored, now almost completely hidden; Ffynnon Elen fighting off attempts of restoration and preservation. St Mary Magdalene’s well at Cerrigydrudion, so close to the centre of the village, but seeming to crumble a little more each time we visit. It is only the wells adopted by the local community, such as St Tegla’s at Llandegla, or those in an area where the elements or local conditions preclude the rapid growth of nature, where we can really see the detail of the well. All other attempts at management and preservation can last only as long as the funds and interest of the body responsible. Then again, over preservation can ruin the well as much. Ffynnon Fair at Bryncroes and Ffynnon Fyllin at Llanfyllin show what the impact being cared for by some municipal grounds man can be. Concrete and closely cropped grass, litter bins and safety railings preserve the structure of a well whilst at the same time seem to drain the life and character out of the site. Just as the neatly clipped lawns in a CADW castle cannot reproduce the reality of the mud and grime, the feasting and slaughter, and the hustle and the bustle of the everyday life of the people who once lived and died in the castle in centuries past. It is difficult, if not impossible to maintain that fine balance between retaining both the structure and some essence of the character and spirit of the well. To me these wells seem to belong to an era when manicured landscapes were unknown and overgrown was the norm;although constant use and community pride would surely have kept the well itself clear. Ffynnon Sara at Derwen and Ffynnon Dyfnog at Llanrhaeadr, although both highly landscaped perhaps achieve it; and we hope that proposed new work at Ffynnon Dyfnog does not detract from its natural setting. Ffynnon Wenfaen at Rhocolyn and Ffynnon Digain at Llangernyw succeed, owing their preservation to their location and to the sheep. It is clear, especially in this time of budget cuts, that there is no easy solution. Wells such as Ffynnon Fyw are no-one’s particular responsibility and they tend not to be protected monuments. Enthusiasts bubble up occasionally and can work wonders, but enthusiasm wanes, and efforts are soon lost. This is hardly new, so many local historical sites, not just wells, have been lost over the last hundred years or so; some by neglect and others intentionally destroyed, the White Well at Whitewell and St Marcella’s at Denbigh amongst those we have visited recently. It is only inevitably that more will follow. In the meantime, despite being so overgrown, the underlying structure of Ffynnon Fyw, thanks to the successive reconstructions appears sound , and thus it has a much better chance than many of surviving into future centuries, and when the next great grass cutter arrives there will at least still be the impressive remains of a once great well to be seen. The origins of the name Ffynnon Fyw are unclear. It has been suggested that it is a corruption of Ffynnon Dduw, God’s Well, although there is no clear evidence for this and it is considered unlikely. It is usually translated as the living Well. Baring Gould and Fisher suggest that it was once dedicated to St Curig, and a chapel similarly dedicated, of which no remains can now be found, stood close by. It is still possible to see that the well within the walls is paved and split into two sections. 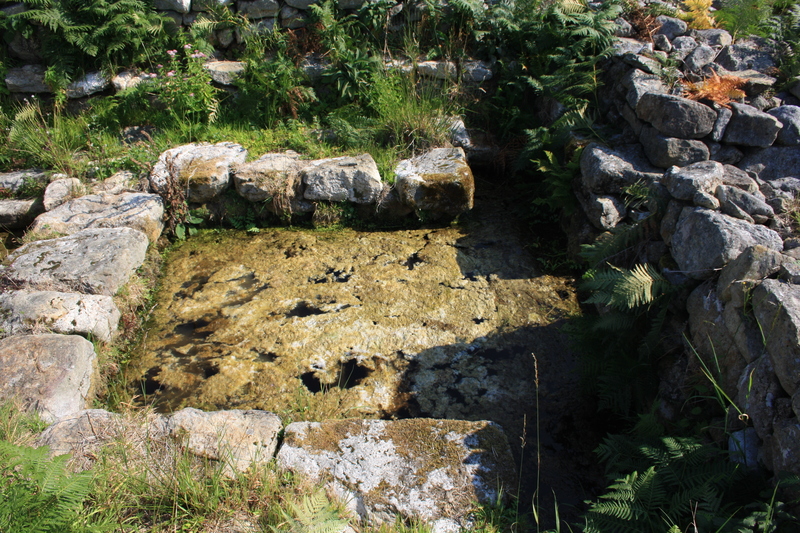 The larger pool, provided with steps into the water, was traditionally used for bathing and the smaller pool for drinking. Stone benches surrounded the water. Fardd writes that in the past a custodian would take care of the well, and for a small fee would show visitors how to use it. It was reported beneficial for childhood complaints, for rheumatism and that it had cured blindness. Eirlys and Ken Gruffydd record the survival of the well’s memory, noting that in 1945 a Birmingham family, having sons missing in the war, visited the well, holding a short service there and making offerings for their safe return. In the past, according to Fardd, the local population would congregate around the well for three Sundays in July, holding sports and games, a tradition that died out in the earlier part of the nineteenth century. The picnic table and a discarded football nearby perhaps show that after all not every sign of tradition has dried up. The majority of the information used in this post is taken from the thorough article on Ffynnon Fyw in Eirlys and Ken Lloyd Gruffydd’s book Ffynhonnau Cymru, volume 2 (1999) The book is in Welsh and any errors or inaccuracies in this piece are wholly due to the vagaries and inadequacy of my own translation.